Whether it’s a bake sale, class party or pot luck, one thing you can count on is that Rice Krispies treats will disappear. The fact that they’re inexpensive and easy to make is a bonus, but there are a few things to remember. — Some of the more recent marshmallow treat recipes have less butter. The older (and better, in my opinion!) 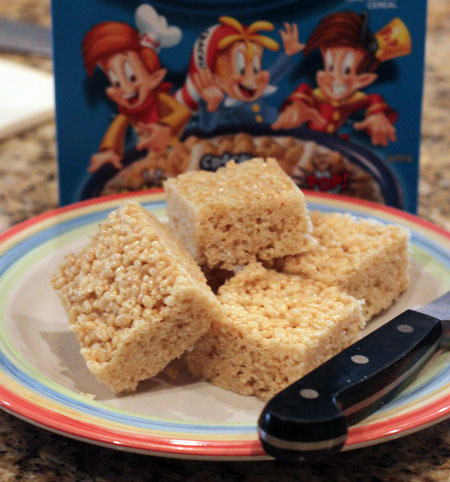 versions have at least 4 tablespoons of butter to 5 cups of cereal. — Salted butter enhances the flavor of the treats. If you don’t have salted, add a pinch to the butter as it melts. — And finally, make the treats in an 8 inch square pan so they’ll be tall and stately. That, or double the recipe. A lot of the more recent recipes call for a 13×9 inch pan, but unless you’re using a recipe with something like 10 cups of cereal, the treats will be smallish. You’ll get more of them, but why make them small when you can make them tall and impressive for slightly less money? Has anyone ever complained about a Krispies Treat being too big? Line an 8 inch square pan with foil and spray foil with cooking spray or rub with some extra softened butter. Melt butter in large (3 quart) non-stick sauce pan over medium-low heat. When butter is melted, add marshmallows and stir until melted. Stir the melted marshmallow mixture constantly, for about a minute after it is fully melted. Don’t let it burn. Remove from heat and stir in vanilla and cereal. Stir until cereal is coated with marshmallow. Using a sheet of parchment paper or greased foil, press mixture evenly and firmly into the prepared pan. Let cool completely at room temperature. When fully set, lift from pan by grasping foil. Set on a cutting board and slice into large squares using a big chef’s knife. This will give you 9 very nice sized marshmallow treats. For a double batch, double the ingredients and use a larger pot and a 13x9 inch pan.